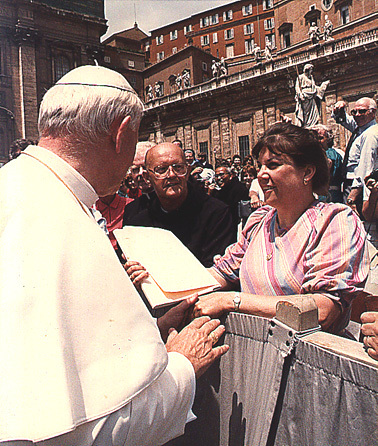 The Pope is receiving a list of the first 10,000 names of Catholic women who had signed the Affirmation for Catholic Women from Helen Hull Hitchcock, Women for Faith & Family director, at a Wednesday Audience, on June 22, 1985. By July of the same year, over 17,000 signatures had been received. More than 50,000 Catholic women have signed this statement of fidelity to Catholic teachings. Copyright © 1999-Present Women for Faith & Family. All rights reserved.